E-cigarettes usage among middle and high school children has doubled from 2011–2012 and Sen. Charles Schumer is proposing legislation to prevent companies from marketing these products to children. The numbers come from the Center for Disease Control. Another recent JAMA Pediatrics study shows that children who try e-cigarettes are seven times more likely to start smoking regular cigarettes. Schumer said e-cigarette companies are clearly marketing to children with social media campaigns, celebrity endorsements, provocative print ads, and cartoon mascots. E-cigarettes contain the addictive substance nicotine, but don’t burn tobacco so the health effects of inhaling tar, chemicals, and carcinogens are negated. The product also allows users to lower the amount of nicotine in their e-cigarettes, for those trying to quit smoking. 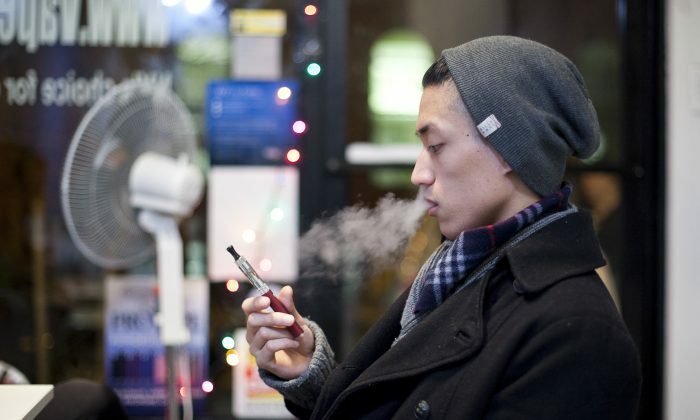 There are no federal marketing regulations currently in place for e-cigarettes. Schumer wants the Federal Trade Commission (FTC) to come up with guidelines to prevent marketing to children the same way tobacco companies are restricted. Big tobacco companies have gotten into the e-cigarette industry as well. The manufacturer of the Newport cigarettes also makes blu e-cigarettes, Camel cigarette manufacturer produces Vuse, and Marlboro manufacturers also make Altria. Tobacco companies are banned from a variety of outlets, including sports sponsorships, cartoon characters, and TV spots. They are also prohibited from selling flavored tobacco products in a way that encourages children to smoke. According to the 2009 U.S. Food and Drug Administration flavored tobacco ban advisory chocolate, vanilla, and other sweet flavors are especially appealing to children, misleading, and encourage underage use. “How many adults want gummy bear cigarettes?” Schumer asked. The vast majority of them do at The Henley Vaporium, a SoHo e-cigarette shop styled like a cafe with over 100 e-cigarette flavors. Shop employee Michelle Chung said most first-time customers come in wanting to switch from cigarettes to a tobacco-flavored e-cigarette, but end up picking a sweet or fruity flavor. At The Henley, Chung said the bulk of the customers are, like her, in the 20s to 30s age group. But there are almost just as many in their 40s and 50s, from locals to regulars coming all the way from Connecticut. With these customers, the idea of going from an e-cigarette to a traditional cigarette is unheard of. Under Schumer’s legislation, the marketing guidelines would be determined by the FTC and it is unclear whether the same rules that apply to tobacco marketing would directly apply to e-cigarettes. Late last year, former mayor Michael Bloomberg signed a bill banning indoor e-cigarette usage in the city. The bill had been met with strong opposition by those who use e-cigarettes, as there are no health-related second-hand effects. Nationwide, smoking rates have fallen slightly, to 18 percent in 2012 after stalling for almost a decade at 20 21 percent. In New York City, the rate is even lower at around 15 percent. Decline in cigarette usage had led to a cultural shift, said then-Health Commissioner Thomas Farley. People no longer see smoking as culturally acceptable, he said, but widespread usage of e-cigarettes could reverse that.